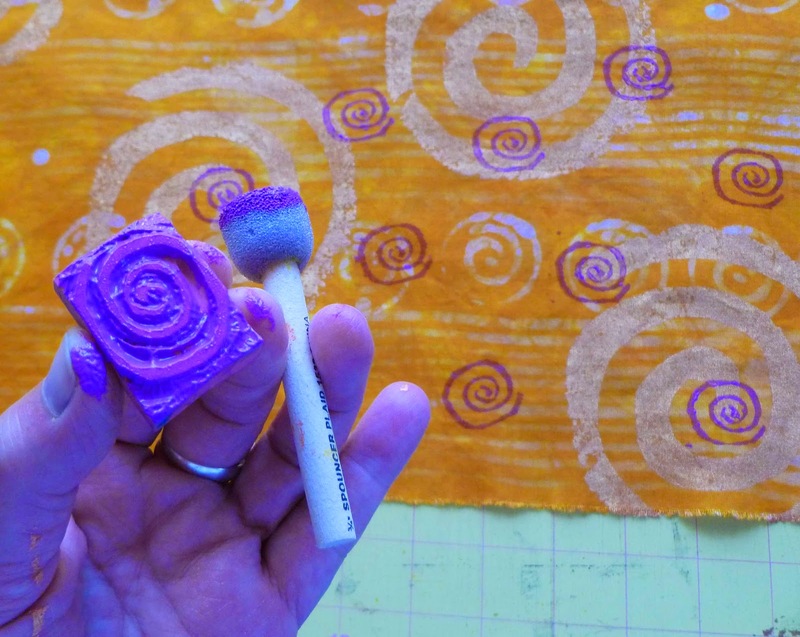 sew sew art: Three to get ready! 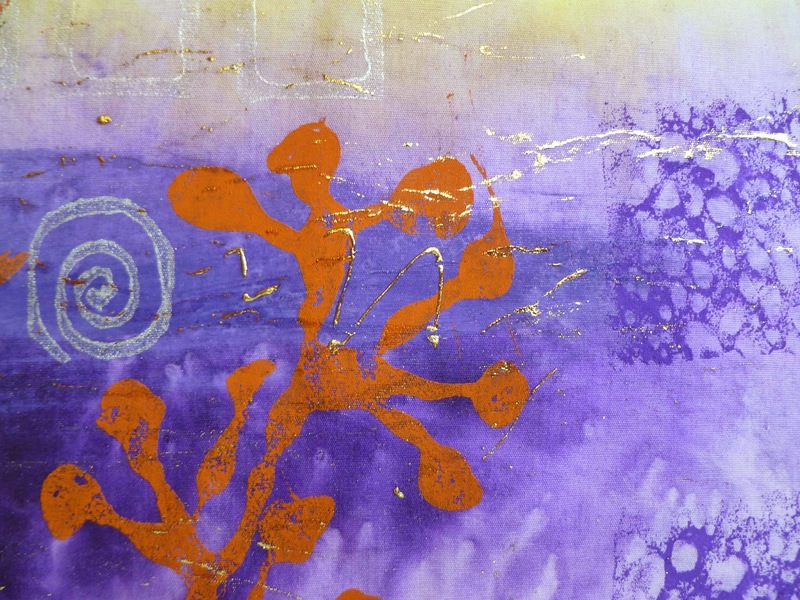 First I thought I would start with a close up of the first two pieces so you can see the details. Now for the next piece. 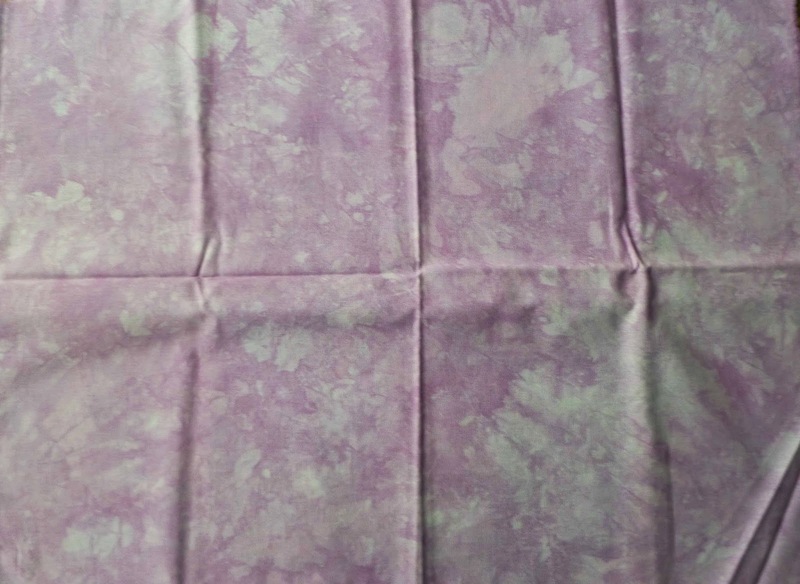 I think the piece of fabric I disliked the most was the pink fat quarter. The first process was dyeing this pink even though it was a while ago. I have had a sudden love affair with hot pink and orange. I think it is a throw back to the late 50's early 60's when orange and pink was a common color combination in clothing. Think Twiggy!! 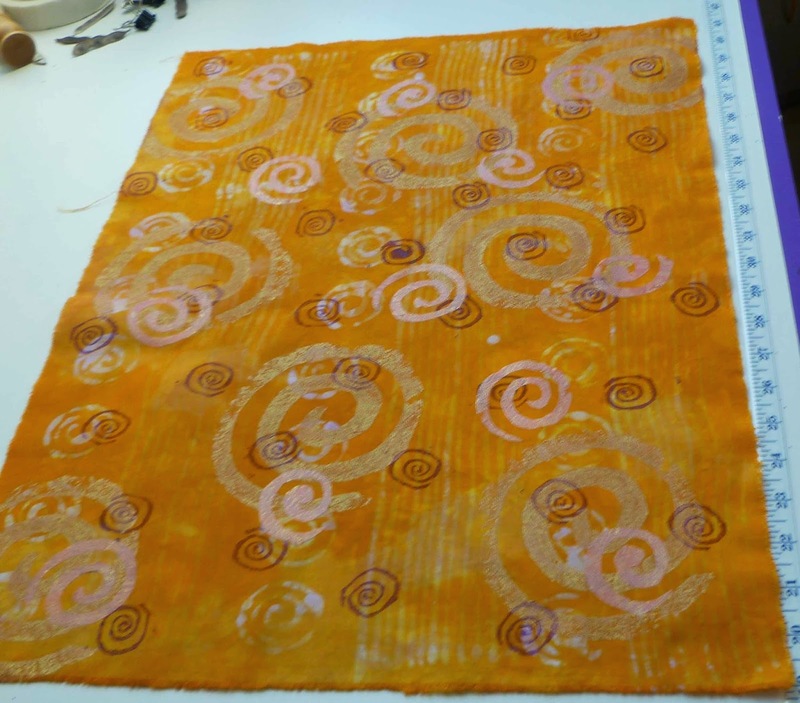 The second process was batiking the fabric and dyeing it this yellow/orange color. Unfortunately I either didn't use enough wax or it wasn't hot enough. I suspect not enough wax on the tool. 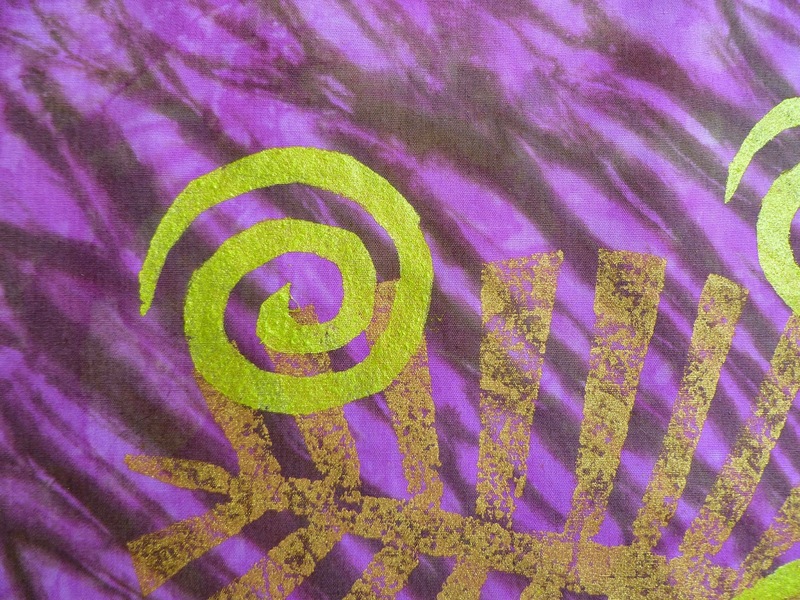 Next I used this old stamp with Jacquard's Halo Pink Gold paint on it. 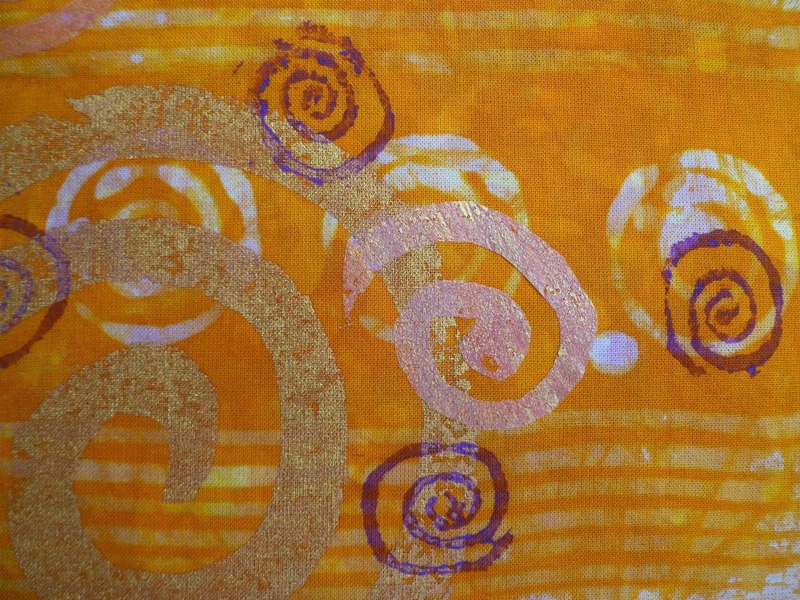 You can see the hint of pink in the gold spirals. 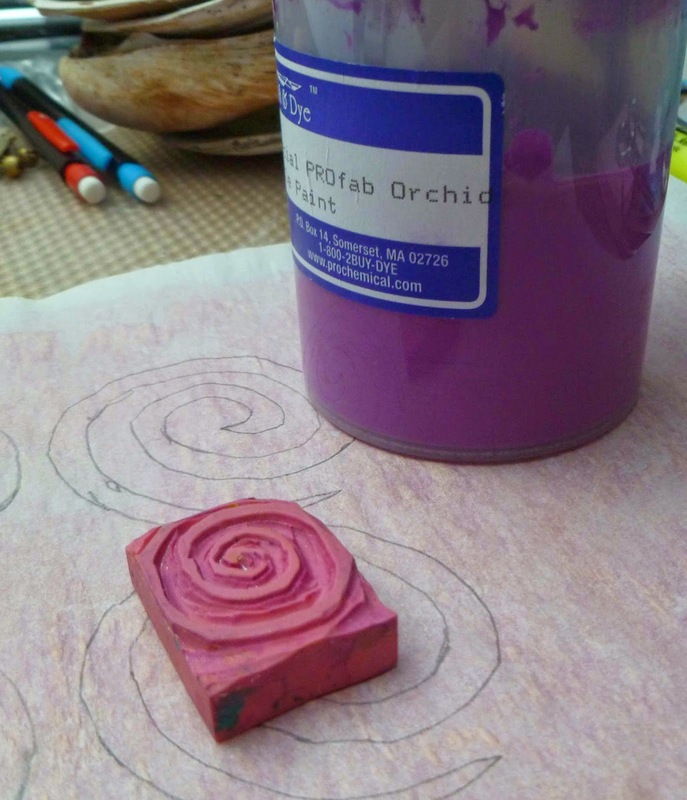 Next I used this magenta ProFab paint with an eraser stamp also an oldie but goodie. 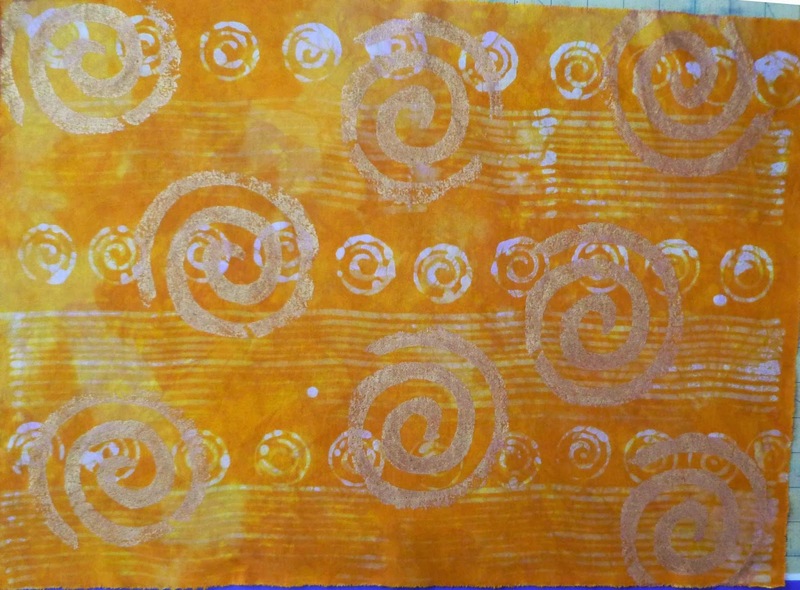 Of course the stamp in the center had a glob of paint on it - right in the center of the fabric. 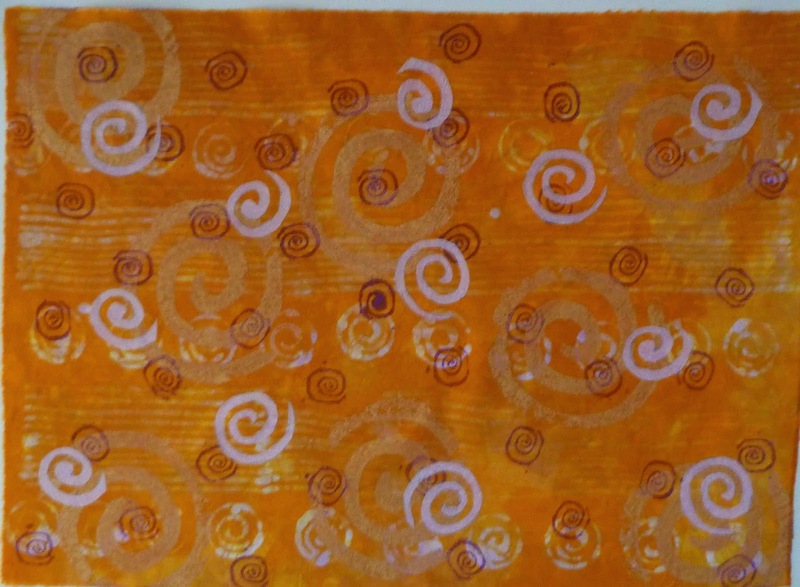 I used the stencil of the spiral from the last piece to trace the lines onto the back or paper side of the painted fusible web - Wonder Under. 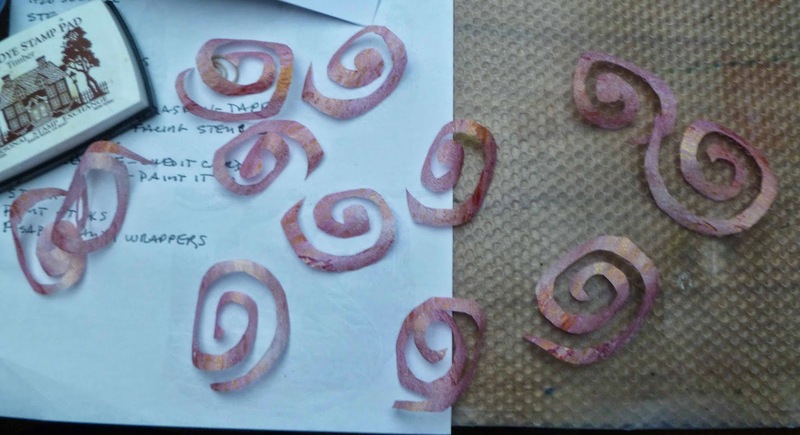 The cool think is that you get a two for one deal with the spiral. 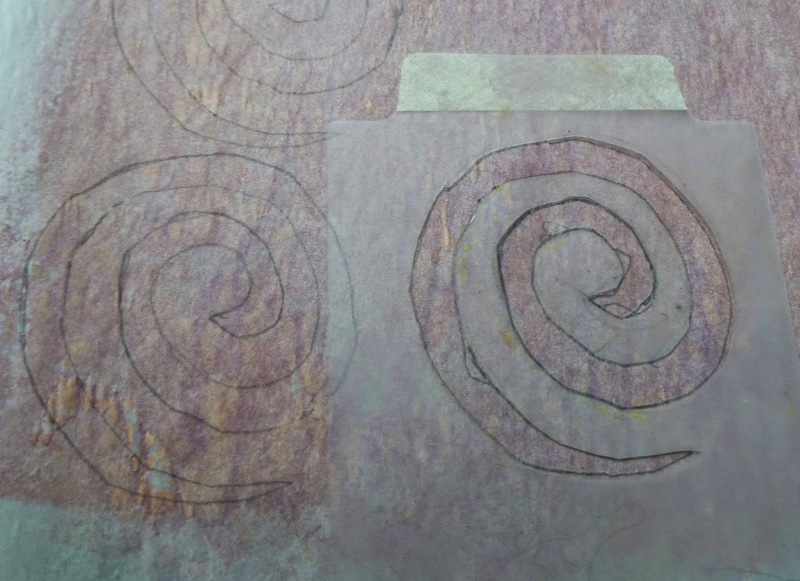 You get both the positive and negative of the spiral (see below). I cut out 6 and got 12!! Bonus!! 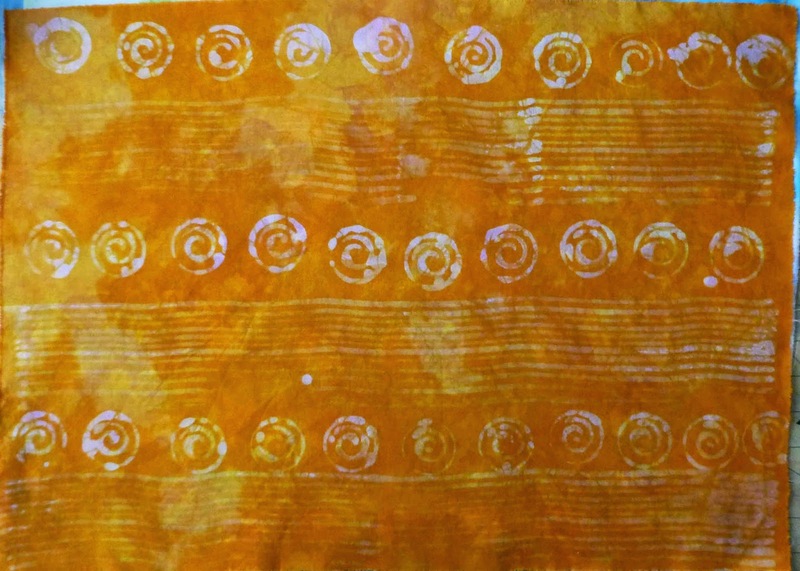 I loosely placed them trying to space them then ironed down each spiral one at a time. 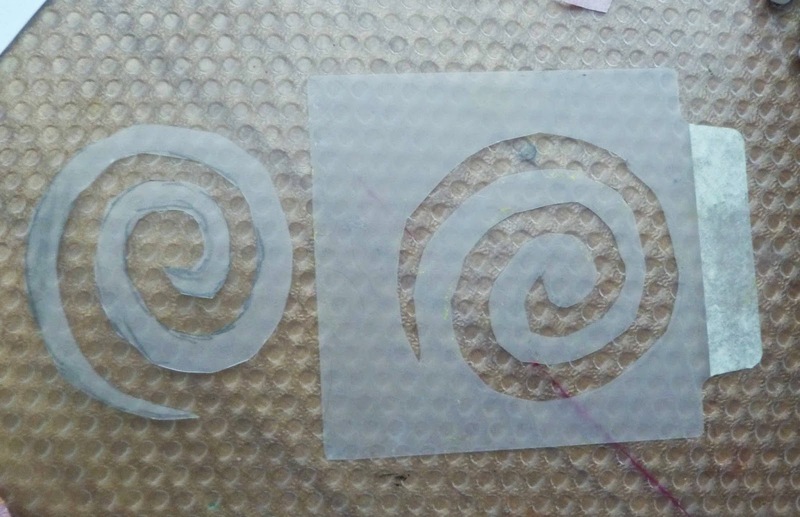 Here are the spirals paper side down and fused. Now I need to pick off the paper. It was at this moment when I realized fiddly shapes were hard to peel!! 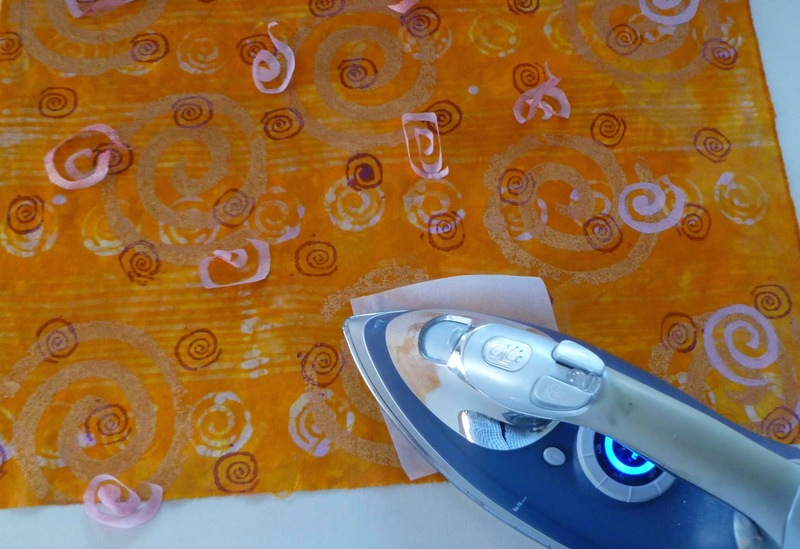 After all the paper was removed I used a sheet of release paper to "go over" the piece with an iron making sure all the painted fusible was really down well. 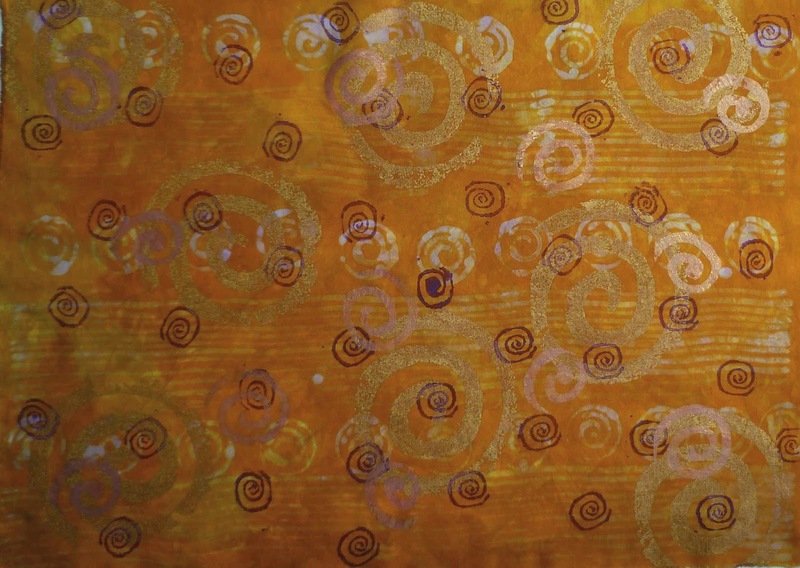 I like this picture because you can see the glimmer of the painted fusible. 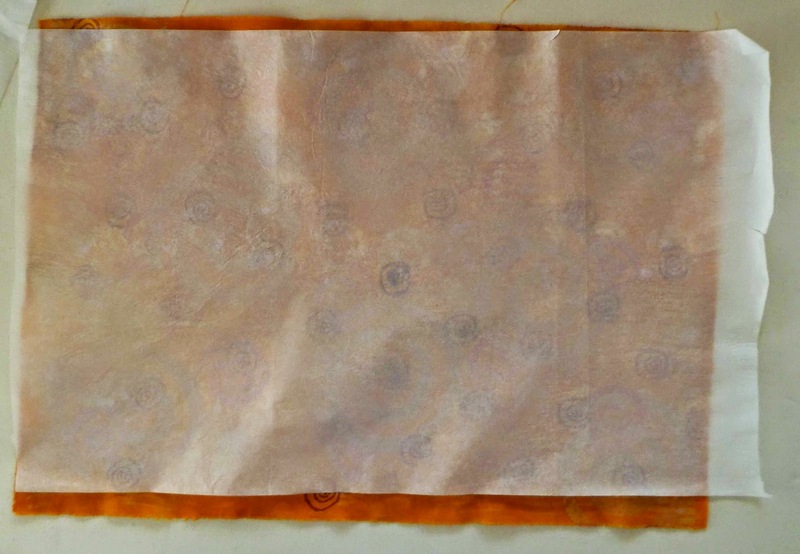 I had used Halo Pink Gold on the fusible webbing. 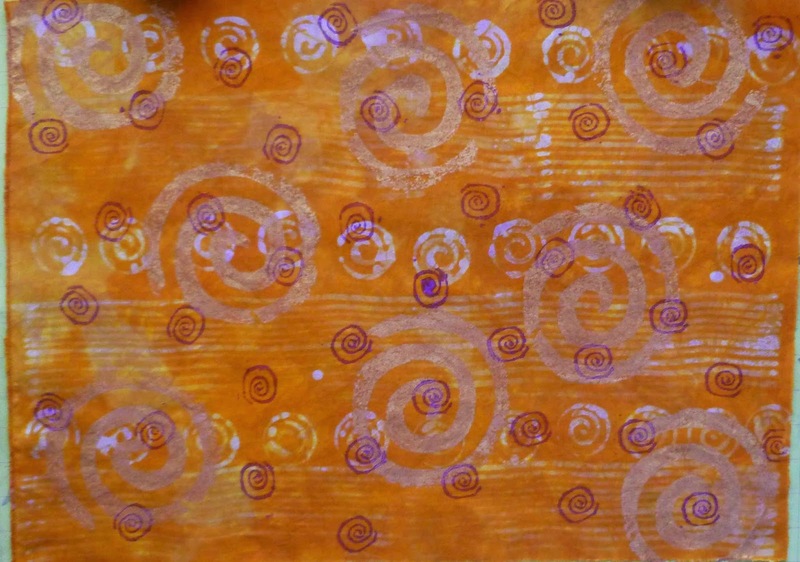 I do like spirals and orange and pink! The colours in this piece are perfection. 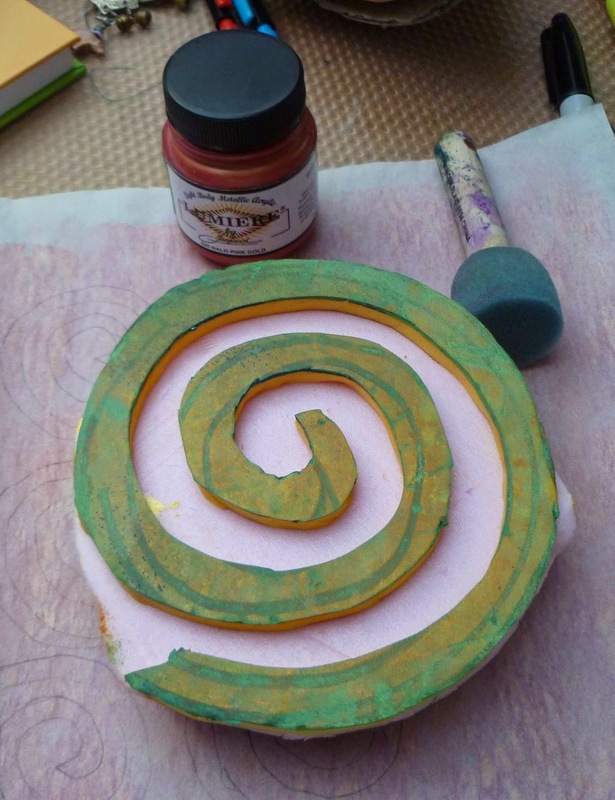 I even like the little glob of paint on the spiral, in the middle.